“Launch sequences” is a marketing term for the process of building anticipation and a sense of urgency to buy a new product rather than simply ‘announcing the product’ once. Email service providers like Infusionsoft have “landing pages” that can be created specifically for creating an opt-in page for this purpose, but you can also make your own using WordPress and Mailchimp or use a service like LeadPages. The key is to create a sequence that builds up anticipation to the announcement, drip out more information about the product over time, and then give a time-sensitive offer to close the deal. This gives you more time to convince and convert visitors into customers. What is the One Weird Trick to Increase Online Sales? If you already have an audience (i.e. a large following on social media and/or an email list), but you’re struggling to increase online sales, consider taking your online marketing to the next level with Google Hangouts on Air with this one weird trick. A “Google Hangout” is like a GotoMeeting: it’s a live video stream of either a camera, a computer screen, or a mix of both. A Google Hangout “On Air” is public and is automatically recorded and saved as a YouTube video on your channel. Why do a live event like a Google Hangout? How will a Google Hangout on Air do that? Anticipation: an email/social media post will be sent out letting people know a new live event is coming and to look for a special invite soon. Personalize: the person/people on the broadcast will set the tone for the brand, add a face to the bottle, and help humanize the marketing. Community: attendees will be able to ask questions, feel like they are part of something bigger than themselves, and win prizes for coming. Email Signups: in order to get invited to this very special live event, you have to give us your email address. Invite your friends! Free prizes! Sell Product: at the end of the event, there will be a special offer good only for the attendees of this very special live event. Stay tuned! What would the person say/do on a Hangout? Teach: show how a product we sell solves a problem the audience has. Share: give insight into something behind the scenes or upcoming that this audience is hearing before anyone else. Make them feel special. Give: do the giveaway(s) for the night via a drawing or by answering a question. Ask: ask the audience to buy a product for a very special price, good that day only, and only for that audience. How would the Hangout work? It’s simply a matter of sharing out a link to join the Hangout and then presenting via your web cam and/or sharing your screen. The important parts are a) showing a face and b) being authentic. If you want to get more advanced later, you can add external cameras and microphones. How often should we do Hangouts? At least once a month, if not once a week. Eventually they could be automated (recorded), but in the beginning they would all be live. 1. Give your audience a name. Ex. Justin Bieber followers are called “Beliebers” and Lady Gaga calls her fans “LittleMonsters”. 2. Incentivize the audience to invite more people into the community. 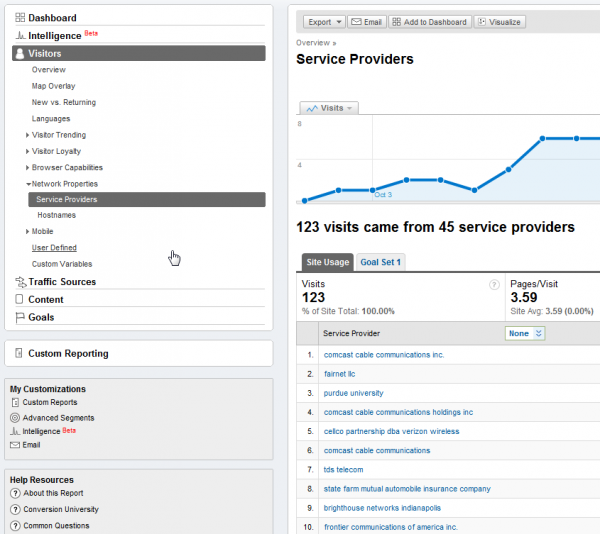 Google Analytics’ Service Providers listing can give you insight into who is visiting your website each month. I was showing one of my client’s their web statistics for the month via Google Analytics and discovered that there was some useful information that I hadn’t been sharing before. When I showed them the Visitors section I drilled down through Network Properties to show them the Service Providers. While Google may have intended this to show Internet Service Providers (ISPs), if a company has a T1 or other type of prosumer connection to the Internet, the name of the business will display instead of the ISP. What that means is that the client now has a view of some of the businesses visiting their site and how often. For those with an active sales pipeline, information like this can be invaluable. Who better to sell to than those who have already been visiting your site? In the case of the client who helped me discover this, they found out someone at a major corporation had been viewing their web site regularly. Now, it could be anyone at that company and it could be for any number of reasons, but what it does indicate is that your web site has something they keep coming back for. When we reviewed the history of that company, they had visited almost every month for the past year. I’ve since started emailing out this page specifically as part of my monthly hosting report. For a more advanced Service Providers search, try the Advanced Filter. Click “Advanced Filter” next to the search box, which brings up the dimension “Service Provider” with the condition “Containing” and a blank value. That much is the same, so here is the ‘advanced’ part. If you want to contain one or more values (remember to use the pipes) and exclude others, add a second dimension for “Service Provider” and choose excluding and your search value. But wait, there’s more. As you may have noticed, you can also add a metric for Visits, Pages/Visit, Avg. 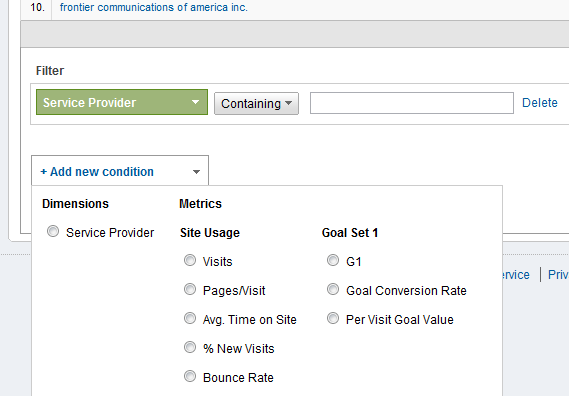 Time on Site, % New Visits, Bounce Rate, and Goals. When used together with Service Provider, you can seek and sort the visitors by number of visits, number of pages, and so on. This is a potentially very powerful sales tool and one that should not be overlooked in your web analytics.